Students from Kansas Wesleyan University were up bright and early Saturday morning. 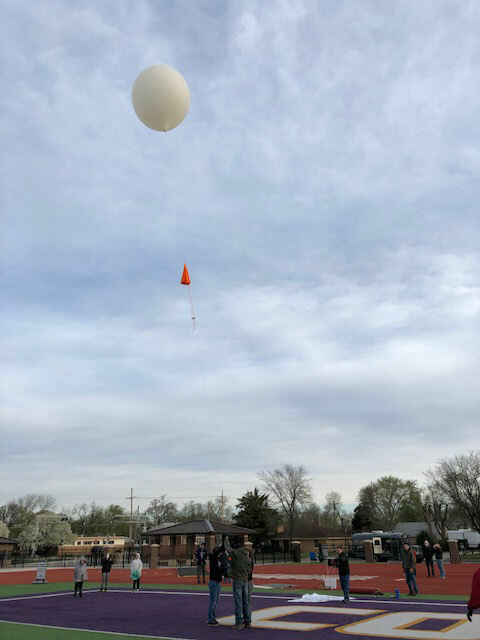 Over a half dozen students from the science and math clubs launched a high altitude weather balloon from the football field at the Graves Family Sports Complex. The balloon was carrying a payload of scientific equipment. Inside the payload was a Co2 sensor taking a vertical profile of Co2 throughout the atmosphere. The group flew the same sensor last year for the Global Space Balloon Challenge, and got second place in the Educational Initiative. The project was also testing an RF data link between the payload and one of the chase vehicles. This RF link will be used to control a gyro in hopes of steadying the payload for better video. After launching, the balloon and its payload drifted east. The mission was a success. The balloon made it to just shy of 98,000 feet. It burst over Fort Riley and landed just east of Tuttle Creek State Park. Following Saturday’s test launch the group will do a launch for the Global Space Balloon Challenge on April 28th, weather permitting.